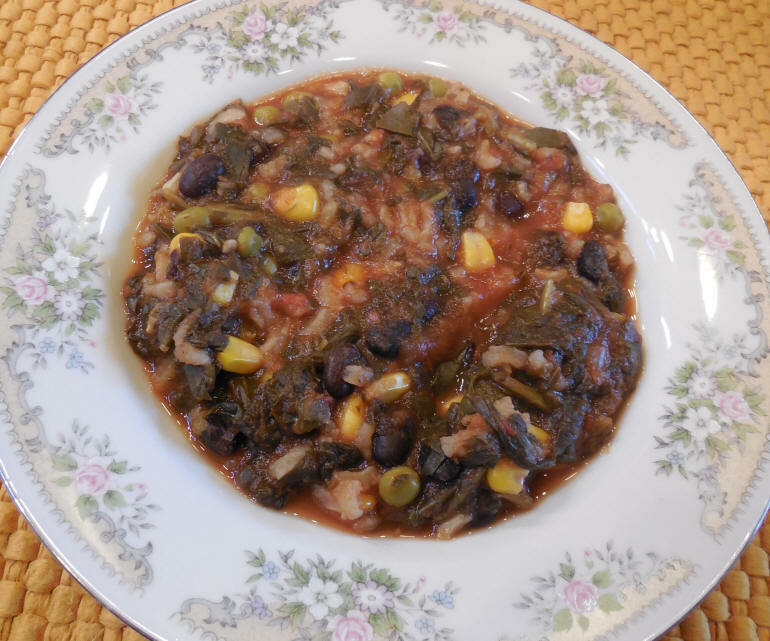 Collard greens black beans rice soup is a delicious Italian style vegan recipe that will serve 8-10 adults as a main meal or twice as many as an appetizer. We like to make a large pot of soup so we don’t have to cook every day, but if you wish to prepare less, cut the recipe in half. We prepare the soup in a large pot on our stovetop, which when covered makes a good storage container to refrigerate leftovers after the soup has cooled. Total cooking and preparation time is about 1-1/2 to 2 hours. 1 cup Brown Rice cooked in 2 cups Water. Begin by placing about 2 quarts of water in the soup pot on the stovetop and turn the heat to high-simmer. Add the crushed tomatoes, tomato paste, oregano, parsley, and hot pepper and mix well. Add the frozen veggies and mix well. If you are using fresh collard greens, wash and clean them, chop or cut them and add to the soup pot. Wash and clean the other veggies, and peel the garlic and onions. cut into chunks and place all these veggies in the container of a high speed blender with about 2 cups of water, cover, and run the blender at high speed until smooth. Add the blenderized veggies to the soup pot. The blender can be washed out with a little water and added to the soup pot. If you are cooking black beans, they should be cooked ahead of time as they can take 4-6 hours to fully cook. Place the rice pot on the stovetop with the water and heat to boiling. When the water begins to boil, add the rice, cover, and lower the heat to simmer and cook until all the water is absorbed into the rice. When the soup begins to boil, lower the heat to a low simmer and cook until the veggies are tender. Add the black beans and rice and mix well. If you want a thinner soup, add 2 cups of boiling water and mix well.